The first stop was in Denver International Airport (DIA) at Steve’s Snappin Dogs, which just opened at this location about 5 months ago. They have a location in Denver at 3525 E. Colfax Ave. We made a beeline for it coming out of the gate when we saw ‘Craft Beer’ on the sign. There were so many craft brews available our heads were spinning. We enjoyed a Rampant Imperial Double IPA from Great Divide and a Modus Hoperandi IPA from Ska Brewing, Durango, CO. The next stop (and a main reason for the trip) was Twisted Pine in Boulder. They have a gorgeous brewpub with everything constructed out of knotty pine wood, including the tap handles. They also have a full menu and live bands. 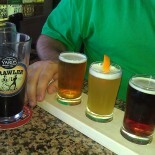 We enjoyed a flight of their house brews and some delicious pizza and hummus. After an amazing brunch and mimosas (and a Stone Saison) with family, we headed to Avery Brewing for the afternoon. We enjoyed a custom IPA flight and some additional tastings off the menu. All were 4 oz. pours and delicious, innovative brews. Unfortunately, we were not hungry as the food coming in the door past us looked and smelled delectable. The next was Upslope Brewing. It was a beautiful tasting room with one very upbeat and bubbly bartender from New England who served us a custom flight, which included a very unique Thai IPA. The tasting room was very dog friendly and we enjoyed watching huskies play as we sipped our brews. We also attempted Boulder Brewing this day, but unfortunately, they’re closed on Sunday. We got some great empty parking lot pics though! We met family for dinner at Mountain Sun in downtown Boulder. Their brewery was in the way, way back with the bar in the back of the restaurant. It was a hip place with various twists on common ales. We toured Red Rocks. Not a significant brew trip, but a whole other experience one should definitely see and feel! Onto Boulder Brewing since we knew it was open. Wow! Boulder’s first craft brewery sure made an impression on us! We tried Black IPA standalone and on Nitro, the Shake Porter, the Buffalo Gold standalone and on cask. The cask brew was a treat from one of the brewers as we were asking questions about it and he was generous enough to give us a pint! We did not visit any other breweries this day, but made a creation of our own for dessert. The Shake Porter with vanilla ice cream is an orgasmic dessert that should be had by all. We spent Tuesday walking around downtown Boulder. What an incredible town! Be careful driving as the locals are very pedestrian friendly. We attempted West Flanders Brewing but quickly turned away once we heard screaming kids from outside. Walnut Brewing was another wonderful spot. Dubbed Boulder’s First Brewpub, they have a very cool set up with two-story signs of their flagship beers hanging from the walls. It’s an expansive wooden bar/restaurant inside and the brewing activities are ongoing down and upstairs. We took a road trip to Fort Collins and visited New Belgium and Odell breweries. WOW! Both these breweries looked poshe and both had incredible brews. We tasted a few seasonals at New Belgium and had a flight of the house brews at Odell. The one brew to remember is Odell’s Double IPA for ALS. At 9% we shared one, but wished for no drive back and some more! We went to Back Country Pizza and Tap House for dinner and drinks before a show at Chautauqua (Taj Majal and John Haitt Band) and this place was off the hook! They had a draft and bottle menu that would blow any beer lover’s mind with a strong Dogfish Head presence and unbelievable brews for all tastebuds. The apps and pizza selections were out of this world. Our hotel (The Monaco – A Kimpton Hotel) had an award-winning restaurant (as usual) Panzano, so we enjoyed local brews and apps at the bar there and then went back for dinner – DELIZIOSO! The mini bar in the room even had a couple local gems – Odell 90 Schilling Ale and a brew from Avery. What an unforgettable trip with hopes to be repeated and expanded in the years to come. We’d be ecstatic to live and blog from there someday! One thing we noticed was that EVERY brewery proudly displayed their medals in the tasting rooms/restaurants and EVERY brewery we visited had at least 4 or 5 medals. Impressive. This entry was posted on August 19, 2014 by wineoh!006 in Uncategorized.